Preheat the oven to 350°F. Line two baking sheets with parchment paper. Toss the butternut squash with the oil; season with salt. Spread the squash in a single layer on one rimmed baking sheet. Roast until tender, about 20 minutes. Let cool slightly and set aside. Place the pancetta on the second lined baking sheet and bake until the pancetta is crisp and the fat has rendered, about 10 minutes. Transfer the pancetta onto a plate lined with a paper towel. In a fine mesh sieve, rinse the quinoa under cold water and strain. Combine the quinoa, water and salt in a medium saucepan. Bring to a boil, cover, reduce the heat, and gently simmer for 12-15 minutes. Remove from heat and transfer the quinoa to a strainer to drain out the remaining cooking liquid. Transfer the quinoa to a bowl and set aside. Add the butternut squash to the bowl of quinoa and fold to incorporate. Season with salt and pepper and portion into individual bowls or plates. 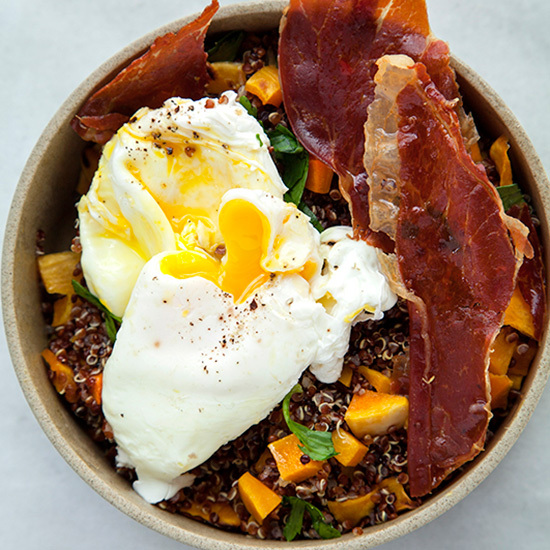 Top each bowl of quinoa with a warm egg and a slice or two of crispy pancetta. Garnish with freshly chopped parsley. Drizzle each dish lightly with olive oil, and a sprinkle of flaky sea salt and pepper. Serve right away.